ORCHARD PARK, N.Y. (AP) Nothing about the Buffalo Bills’ impressive start to the season comes as a surprise to cornerback Leonard Johnson. Though new to Buffalo, Johnson is no stranger to Sean McDermott. And Johnson says the Bills’ first-year coach deserves much of the credit for instilling a winning mentality with his team-first approach in a bid to resurrect a franchise in the midst of a 17-year playoff drought – the longest active streak in North America’s four major professional sports leagues. ”If there’s one person I believe in, it’s him,” said Johnson, who spent last season in Carolina, where McDermott served as the Panthers defensive coordinator. Turning down an offer to re-sign with Carolina last spring, Johnson instead called McDermott to see if he had a spot for him in Buffalo. At 5-2, the Bills are a half-game behind New England in the AFC East following a 34-14 win over Oakland on Sunday. And Buffalo heads into its game at the New York Jets (3-5) on Thursday night with an opportunity to enjoy its best first half since opening the 1993 season at 7-1. 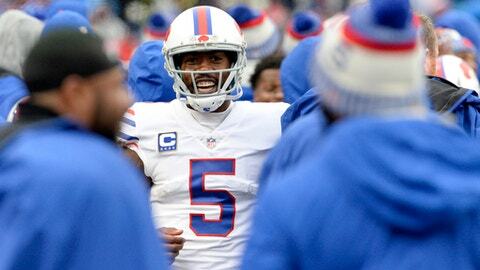 The Bills are succeeding despite a revamped roster with just 24 holdovers from last season, a new coaching staff and front office, led by general manager Brandon Beane, and despite continuing a yearlong purge of under-achieving stars. The overhaul began in March, when Buffalo cut ties with most of its entire defensive backfield, including not re-signing cornerback Stephon Gilmore. In August, receiver Sammy Watkins, selected fourth overall in the 2014 draft, was traded to the Los Angeles Rams. Defensive tackle Marcell Dareus became the latest subtraction on Friday, when he was dealt to Jacksonville for a conditional sixth-round draft pick. The Bills responded to Dareus’ departure with their most lopsided win of the season, and with starting defensive backs Jordan Poyer (right knee) and E.J. Gaines (hamstring) sidelined by injury. The defense forced a season-best four turnovers, including rookie linebacker Matt Milano scoring on a 40-yard fumble return, while LeSean McCoy led the offense with a season-high 151 yards rushing and a touchdown. The Bills’ two losses have been decided by a combined 10 points. And they’ve won twice when tied or trailing in the fourth quarter, something Buffalo managed just twice over the previous two years under former coach Rex Ryan. McDermott arrived in January with ”stick to the process” and ”next man up” messages, which have thus far been validated by how players – rookies, veterans and journeymen – have bought in and contributed in the clutch. McCoy might be the focal point of the offense, but others have made impacts. Andre Holmes has scored three times on just 11 catches. Receiver Deonte Thompson was signed on Oct. 17 after being cut by Chicago, and five days later led Buffalo with 107 yards receiving in a 30-27 win over Tampa Bay. On defense, safety Micah Hyde leads the NFL with five interceptions. And yet, others have made valuable contributions, such as Milano. Aside from scoring a touchdown, the fifth-round pick has forced a fumble and has an interception in two games since starter Ramon Humber broke his right thumb. And yet he briefly let down his guard Monday in reflecting on how the Bills have outperformed preseason expectations. ”I’m extremely proud of them and I’m happy for them,” he said.